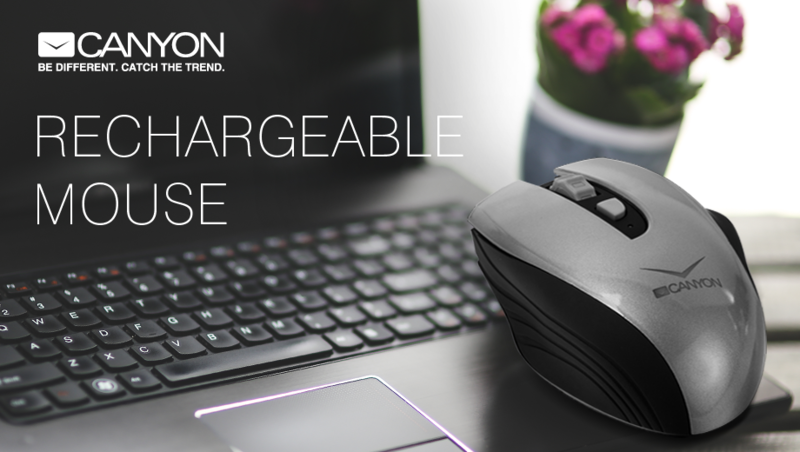 The Wireless Mouse by Canyon Does Not Require Batteries! Spring, 2016. Canyon brand has presented the new, ultra-light wireless mouse that works without batteries. You could have probably stuck in a situation when your wireless mouse stopped working right in the middle of a working day. And you, again, had to change its batteries! With CNS-CMSW7 mouse by Canyon, it won’t happen again, because it has a rechargeable mini battery unit. It can be charged anytime via USB-port of your computer, or from a power socket. If you work 8 hours a day, the battery charge should last for 2 weeks. This mouse is ultra-light and portable, it weighs only 140 grams. The ergonomic shape and soft-touch coating of the mouse allow to comfortably hold it in your right hand throughout the whole working day. In addition, the device is equipped with sensitivity sensor switch between 800, 1200 and 1600 DPI, which greatly improves working with a big screen or two monitors. A micro USB-receiver and a cable for charging and connecting to a computer are included. Canyon » Canyon News » The Wireless Mouse by Canyon Does Not Require Batteries!